I can’t believe it is already time to welcome in a new year! My blog grew a lot in 2015 and I think Working Mom Magic is ready for a makeover. I am currently working with a fantastic web designer to get this ball rolling. My goal is to streamline the site to make it more enjoyable for YOU! After almost 2 years, blogger has been very good to me… but I am dealing with some serious growing pains here and I think I need to finally make the switch over to self-hosted. So stay tuned!! 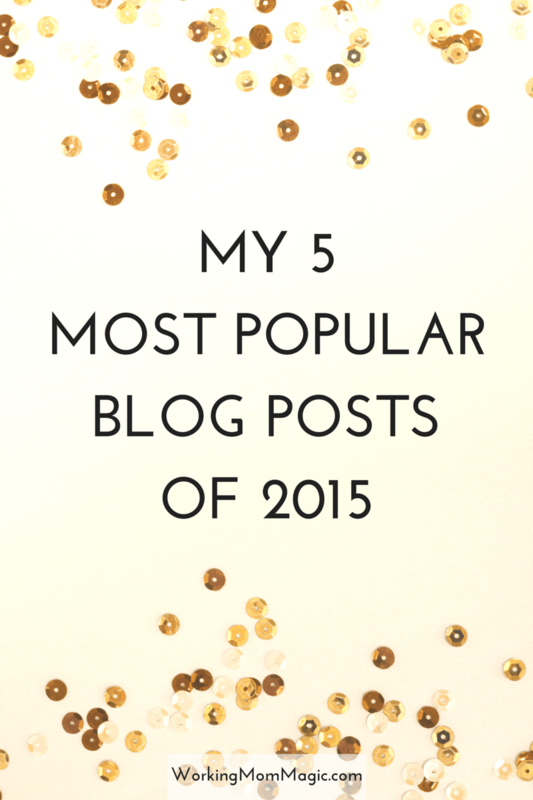 Last year, I ended the year sharing my 5 most popular posts from the year, so I thought it would be a great way to end 2015 as well. So here are my top 5 posts… based on pageviews. 5. 5 Small Healthy Changes That Make a Big Difference: I really loved this post, since I did think these changes made a big difference for me. I still only drink one cup of coffee a day… occasionally I’ll have a second cup later in the afternoon. I know plenty of moms who drink A LOT of coffee and I was one of them. I still can’t believe how much I used to drink, and how much better I feel now that I only drink one cup. A stomach flu is what finally helped me break my caffeine habit, but trust me when I tell you that you DO NOT need all that coffee. Cut back and see how much better you feel. For real. 4. How to get eBooks for Free: I wrote this post when I first started my blog and decided to rework it this year when they updated the library website. This is how I get ALL my e-books and I still think it is the most amazing thing ever. If you are joining my 2016 Reading Challenge, then you need to get on this. 3. DIY Tassel Bracelets: This post got picked up by a few websites and did really well. I think the simplicity of it, along with the clean, bright pictures is what helped this cute craft pick up so much steam. 1. 5 Things Teachers Wish Parents Knew: This was BY FAR my most popular post of the year. It went viral after a BIG Facebook page posted it… and it was shared thousands of times. It was picked up again a few months later by a different big Facebook page, which made it go semi-viral for a second time. I actually worked on this article for a long time, and was even hesitant to post it. At the time, I was having issues with my son in school and had countless meetings with teachers, specialists, guidance counselors and principals. I always left those meetings feeling like they were holding back. I thought they knew what they REALLY wanted to say to me, but couldn’t, since we live in a super PC world right now. I emailed all my friends who were teachers and asked them what they wished they could tell parents, if they wouldn’t get in trouble for it. I also asked them to forward it to any teacher friends that would be interested. I was shocked by how many teachers wrote me back. Teachers I had never even met wrote me long, detailed emails about their students… their stories… and what they wished they could change. The craziest part is that most of them said the exact same things. It not only changed the way I communicate with my children’s teachers… it changed the way I parent. That’s a wrap for 2015! I also would like to say THANK YOU! Thank you for reading my blog, chatting it up with me on social media and for just overall being amazing! I seriously love you guys and I can’t wait to see what 2016 brings! I love all of these – but especially the small healthy changes and what your kid's teachers want you to know. And if I remember, you had loads of awards this year too? Rock star! Can't wait to read with you along with your reading challenges. The cleaning up book is awesome. Happy New Year! Happy New Year to you as well!! I still love that small healthy changes one too.. since they made such a difference for me! Same to you lady!! 2016 is our YEAR!!! I actually remember the Teacher one! That was WAY before we met through your Scoper Challenge! It actually helped me a lot 🙂 Can't wait to do the reading challenge! I am looking forward to it as well.. but I am STILL On the library wait list for the tidying up one! ha! i love these and being to look back on your great posts! (I think they're all good BTW) but such a fun way to recap! looking forward to 2016! It is fun to see what resonated with people the most… most of these I would have never thought would have made the top 5 when I was writing them! ha! I have really been considering the jump to self-hosted as well! Although I love Blogger, I know it would be a great decision. 2016 is the year to do it 😉 Can't wait to see your new design! Thank you! It was a fun ride for a few months, thats for sure! I loved your post about the things Teachers Wished Parents knew. That was a great one! I see why these posts were so popular. Great topics! Especially the ones about 1st year blogging and 5 things teachers wish parents knew. Thank you!! Those two were prob my favorites! Happy )almost) new year! I can see why each post was a fan favorite. I really loved the lessons learned in your first year – I'm with ya, and the DIY tassel bracelets. Ingenious! Great post. I read some of the popular posts and feel like I know you better and can definitely relate to some the points you made about blogging. Here's to more adventures in the new year! What a great idea for a post! Those are some great top posts! Such a great mix of posts! I remember #2 well…and totally have to check out the ebook post! I can see why they were popular, they are all great posts! Happy new year! Hehehe you had some pretty great post this year!!! I had no idea your one post when viral! That's too cool! These are all great posts! I love hearing about the back story of #1 though. I can only imagine how nice it was for all the teachers to be able to let loose to a parent and explain their point of view without PC worries. Great list! I really love the "6 Things I Learned in My First Year of Blogging." I'm only about six months into my blog, but I feel like I can relate to this – especially the advice about finding other bloggers. Making blogger friends has turned out to be one of the most fulfilling and beneficial parts of blogging so far. Cheers to a fantastic 2016 for your blog! It is a tough world these days when teachers can't talk to parents openly. There is one facebook cartoon that makes the rounds occasionally where in the past, parents and teachers would be mad at the child for not behaving. Now the parents and child get mad at the teacher when the child behaves. I'm always glad to have gone to school when I did! After following your blog for quite awhile, I can say for certain it is one of my favorites. All your blog posts are awesome! I wish more parents heard real talk from teachers, it would make a big difference.